A good sized group joined me for my official Climbing-Knapsack trip to the northern part of the state for as many peaks as we could climb. The climbing was all class 1, with plenty of trails, and car camping, instead, to alleviate the strain of heavy packs for once. This was Labor Day weekend, so I looked forward to a great few climbs. These were new peaks for everyone! We drove north on Interstate 5 to Mt. Shasta City, where we met Saturday morning. We car caravanned, driving on backcountry roads, then National Forest dirt roads, to the PCT trailhead deep in the Shasta-Trinity National Forest. This was also the trailhead for Deadfall Lakes. Our whole group followed me up the trail, which was well-signed. A trail junction was sited near a patch of endangered species. The pitcher plant attracts insects to enter its cupped "leaves," with them then trapped inside, and slowly digested. I never knew that carnivorous plants grew in California. We left the Pacific Crest Trail to hike to Deadfall Lakes. They are situated below the mountain named Mt. Eddy. The summit of Mt. Eddy is the highest point, west of I-5, along the whole West Coast. A rough use trail leads to the top. Another rare species, Foxtail pines, grows high on these slopes. As we climbed, a large equestrian group came slowly down the mountain. We stared at each other. In a historic note, a museum photo shows that a horse had also been taken to the top of nearby Mt. Shasta. We reached the Mt. Eddy summit, where a small building stood. The view of Mt. Shasta across the Interstate was interesting. Leaving a register, we retraced our steps down, and then finally came back to our cars. We drove on west to a campsite along the Scott River. The next morning, we left a car at one trailhead, and drove to the other end of a planned shuttle hike. All could see we were doing a car shuttle. I figured for a team effort, with an excellent hike that could only be done this way. Starting at about 8 a.m., we climbed up to Paradise Lake. It became a bit warm. We made our ascent of Kings Castle, a highpoint of the Marble Mountains. There were biting flies on the summit, but we schwhoosed them aside. We had our lunch. I left another register. We hiked cross-country along the big ridge, south, above the Pacific Crest Trail. At the first opportunity, we dropped down left to take the PCT south to our next peak. Two hikers along the PCT were the only others we encountered today. It was about four miles to the base of Black Marble Mountain. 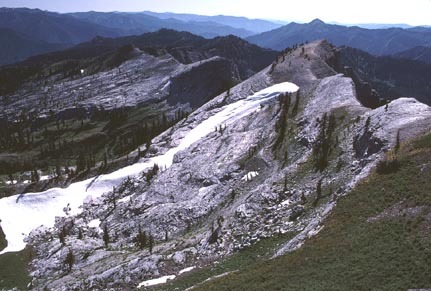 A thousand foot climb took us to its top, where a good view (above photo, left) of the Marble Rim was obtained. We enjoyed the view to the south of some unnamed peaks, here in the Marble Mountains Wilderness. It was my plan to top the highest point of the Marble Rim, too, but our time left was too short. We had an unexpectedly long six mile hike back to the trailhead, where we had left the one car. It was cold and dark as we arrived. Unbelievably, the driver of this car stated her intent to leave the activity. This was a conscious, deliberate reneging on her agreement to help complete the shuttle. Seven hikers would then be stranded eight miles from their cars at the other trailhead. Some of them had no warm clothes. I knew well that transportation was not the responsibility of the Club. We weren't going to physically take control of the car. I knew this person was probably gloating at the power she now wielded. Perhaps we were to get on our knees and beg. I prepared to walk the eight miles in the dark to get my own vehicle. I was on my way, when the others saw the situation. I told them, "Take it up with (her)." I said that it would be at least three hours before I'd be coming back with my own transportation. She really was going to make us beg. "No packs in my car," she declared. I protested, since I would have to get out my wallet, keys, headlamp, and other items. This was getting ridiculous. She now blamed me for the other drivers not getting a ride back to our cars. We all were forced to comply. I heard a non-stop complaint of being "forced" to drive, even as we obviously had given her a ride. She knew well her rights, I have to hand it to her. 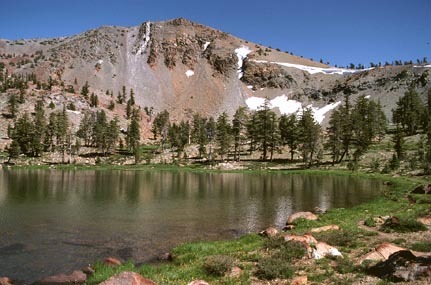 Seven hikers left in the dark, at a remote wilderness trailhead. Only the local chapter would later grant her a big promotion, a chairmanship, and a chapter award. She then left the trip. I didn't get much sleep that night. Her boyfriends were powerful chapter officials, I would find out later. Even a signed agreement to complete the shuttle would be regarded by them, some attorneys, as a worthless "piece of paper." One hiker who had stayed in the campground that day had gotten worried. The situation couldn't be explained. It's hard for most to believe or understand such apparently premeditated, malicious behavior. We drove back to the Interstate on our last day. The small, conical hill next to the freeway, north of Mt. Shasta City, was to be our short hike for today. A regular USFS trail leads to the top of Black Butte. The major difficulty is getting the dirt road directions to the parking lot. The trail is well built. The concrete foundation on the summit overlooks the freeway. There is a view of Mt. 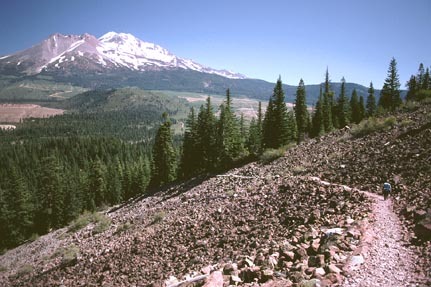 Shasta, although from this angle, much of the forests on the lower slopes are seen denuded, or as tree farms. We enjoyed our hour summit stay, and returned to the car for a drive home. The Central Valley heat was over 100 degrees. With my lack of sleep, it was real Hell. I had to stop in air-conditioned restaurants for a break. Coffee no longer helped. I got our carpool home safely, and that was the end of our otherwise glorious, four peak weekend. We had done more hiking and peaks, in just this weekend, than most local chapter hikers now will do all year, or even in their lives. Our total stats were, very roughly, 26 miles with 9,000' gain. Many construction projects are allowed to proceed, then slapped with a Club lawsuit halting the work midway, at great expense to the developers. I don't know if the spirit of this tactic was being applied against us, or me, this weekend. But leaving your fellow hikers to suffer without transport seems in a similar vein. I have never experienced such sadistic, conscientious cruelty from another participant after doing such a service. The local chapter executives have approved this to the hilt. Promotion and award, even cheers. I was asked to write up this otherwise highly successful event for the local chapter newsletter. I left out this unpleasant end to one climb, as I am warned about "slander." But then, upon seeing "my" work in print, I noticed substantial rewriting. And, it declared, "five" peaks we had done! Can we ever get the facts published straight? This sad chapter must be in a state similar to the well-known 1950's science experiment, where over-crowded rats attack each other, and even their own offspring!